Keeping your home warm and cozy during winter can prove to be a challenge. Luckily, there isn't much to it, especially if you have wall-to-wall carpeting in your home. When the weather outside is frightful, your home may be your only escape. During the winter when outdoor temperatures are freezing, making your home warm and cozy will help brighten your spirits. 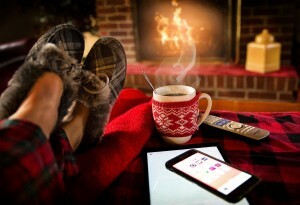 Check out the tips below to make your home warm and inviting this winter. If the weather outside is a mess, why not stay in bed longer on the weekends? Your bed should be warm, cozy, and comfortable so that you can get a good night's sleep but it also doesn't hurt if it's warm and inviting even when you're not sleeping. To make your bed warmer this season, switch out your normal sheets for flannel sheets which are more toasty. Top off your bed with a cozy quilt or a chunky knit blanket that is just as warm and soft as it looks. Add some pops of color and texture with pillows and cushions that will make your bed even more comfortable. If you're lucky enough to have a fireplace in your home, put it to use this winter. Before lighting a fire, however, be sure to clean out the fireplace and chimney or get them professionally cleaned by a chimney sweep. If you haven't gotten it cleaned after using it last winter, there may be creosote build up on the walls which can catch on fire and cause your toasty fire to burn out of control. Once it's clean, don't forget to use a screen to prevent hot embers from popping out of the fireplace and onto the floor of your home. Not only is this dangerous, it can also stain your flooring. Once everything is set up, grab some throws and cushions and snuggle up by the fire. When it comes to warm and cozy flooring, there's no doubt that carpet is as warm and cozy as it gets. Not only does it work as insulation, helping to keep your home warmer during the winter, the soft texture and cozy feel it gives a room can't be denied. If you don't have wall-to-wall carpeting, you can achieve a similar effect with area rugs. You can place area rugs strategically in different rooms to give them a more cozy and inviting feel. Once winter is over, you can store these until next year. If your home has wall-to-wall carpeting, making it feel cozy may not be such a big struggle. However, you will need to get professional carpet cleanings in order to keep it looking clean and inviting. To get your carpet professionally cleaned by the best carpet cleaning service around, contact Tacoma Cleanpro at (253) 229- 7499. During the winter, heat can escape your home through the windows even if they're closed. To prevent this, first be sure that the caulking is still good and that they're properly sealed. Once this is taken care of, invest in some heavy drapes that will help you keep the warmth inside. Heavy drapes can act as a barrier between your home and the windows, preventing the cold from being let in and the heat from being let out. For the best results, close all of your drapes at night, especially if you have the heater on. During sunny days, open the drapes to allow the sunlight in your home along with the warmth it brings with it. The lighting in your home can have a large impact on the feel of the house overall. A dark lighting scheme or bright white lights can make a room feel colder while warmer, yellow toned lights can help soften things up. Use a combination of ceiling light fixtures, floor lamps, wall sconces, and other lamps to come up with the perfect lighting scheme for every room in your home. Even the smallest of details can help your home become a warmer and cozier space for all. For example, lighting a few candles can make things significantly more cozy. The soft candle light helps but so do the scents you choose. Stick to Christmas or winter scents that can help set the mood this season. Adding throws and cushions to chairs or sofas can also make them look more inviting and toasty. Stick to warmer tones and softer fabrics this time of the year. Keeping your home's carpeting clean and plush will make it much more cozy and inviting. To achieve this, be sure to get regular carpet cleanings in Federal Way. Schedule your next carpet cleaning with the best carpeting cleaning service around, Tacoma Cleanpro. Contact them at (253) 229- 7499 and be sure to ask about their additional services.